Last night's win put Texas back at .500, but a competitive division race means that they are still in 7th for the moment. Another matchup against the ailing Rampage could help to remedy that. The big news since last night is the return of Denis Gurianov and Dillon Heatherington to the Texas roster from Dallas. Gurianov collected his first NHL goal yesterday afternoon against Nashville. In addition, Taylor Fedun should be available for the contest. In just a few days, Texas went from big trouble on defense to having Bayreuther, Heatherington and now Fedun all in the lineup as veteran options. Goes to show how quickly things can change in the AHL. 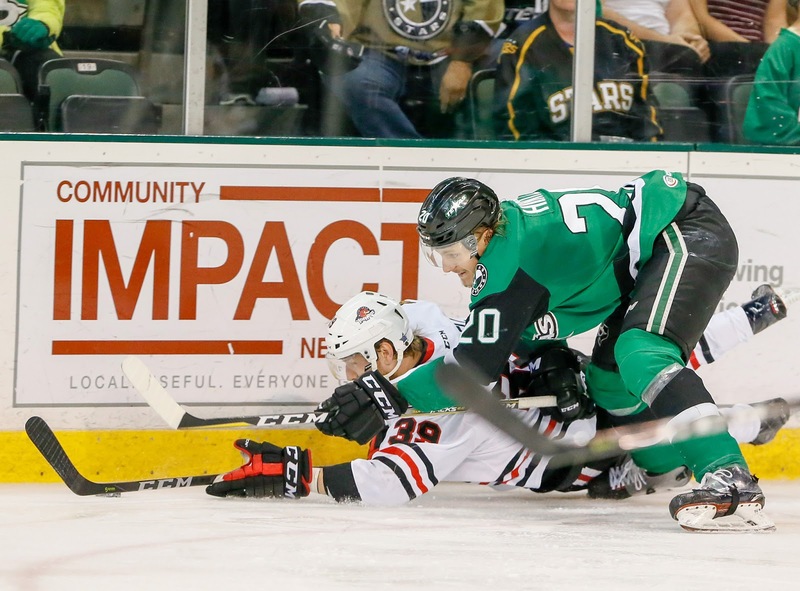 Obviously the Stars aren't going to replicate an 8-1 win (but they wouldn't mind if they did). San Antonio, on their home ice, will have a push back. Michael Mersch missed last night's game and was in a walking boot postgame. If you start strong, you’re going to have a much easier night. Texas took to that playbook in a ig way this evening with a four-goal opening frame en route to an 8-1 final over the visiting San Antonio Rampage. Erik Condra netted a hat trick, and Justin Dowling had a four-point night in the win. “We had a good week of practice,” said Coach Laxdal. “We had a tough last couple weeks, and it was good to see our guys respond and implement the things we worked on. Before the game, the Stars were hurting for defensemen with the recall of Ben Gleason to Dallas being the third of their blue liners to head up I-35. The return of Gavin Bayreuther was a welcome sight for the club, and he made his presence known on the evening, generating a goal and an assist, both with his cannon of a shot from the blue line. He joked before the game to his teammates that he was the vet on defense, despite only being in his second season. Landon Bow might have had a cushion, but he still came up with some stellar saves in the contest. He had one of the best save sequences of the game in the second period as Jordan Nolan broke in alone shorthanded. Bow stoned Nolan on the initial shot and his rebound to keep the score at 5-1 at the time. He finished with 30 saves on 31 shots. Bayreuther’s aforementioned cannon got things started in the first period. Just 51 seconds in, Erik Condra tipped his shot for the 1-0 score. Colton Hargrove went next, the beneficiary of a lifted stick sending the puck unexpectedly away from the control of Joel L’Esperance. 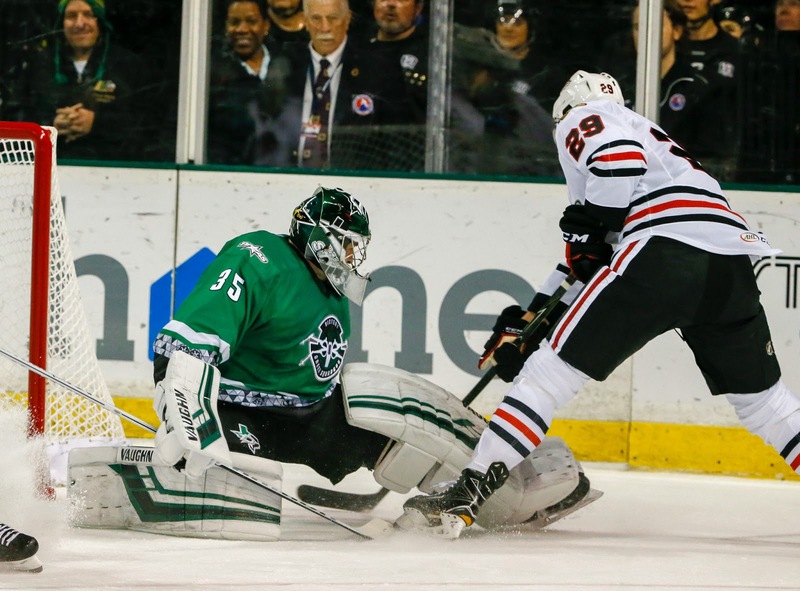 In short order late in the frame, the Stars made their 6th-ranked power play sing with a pair of tallies. L’Esperance lifted one over Ville Husso first, off the assist of Roope Hintz and Justin Dowling. Then, Bayreuther got one of his own from the point. Ville Husso’s night was done after the period, stopping 9 of 13. The Rampage got one back to start the second period on a slick play. Cross ice and through traffic, Jordan Nolan found Jakub Jerabek sneaking down from the point. The defenseman hit the corner for the 4-1 mark. Justin Dowling would not let that stand long, tipping John Nyberg’s casual shot past Binnington. In a game that was already 5-1, it’s hard to believe that you could say things got more out of hand in the third period, but indeed they did. Erik Condra potted two more to complete a hat trick, and it was clear the wheels had completely come off the bus when Colin Markison wrapped around for the 8-1 marker. Binnington seemed resigned to his fate that it would be a goal almost before Markison collected the rebound to head around the net. The veteran line of Morin, Dowling and Condra combined for nine points on the evening, so the right thing paid off this evening. 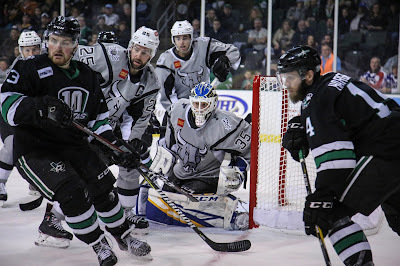 Texas hits the road, literally, tomorrow to play the Rampage in San Antonio with a matinee start time of 3 PM. Tonight’s attendance was 6,863, a sellout. Three big moves for Texas today. First, the Dallas Stars made a trade, acquiring Taylor Fedun from Buffalo in exchange for a conditional draft pick. 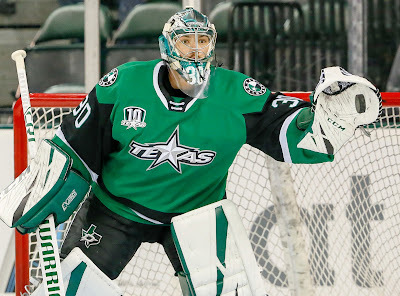 Fedun was immediately assigned to the Texas Stars. He's a veteran of 346 games played in the AHL, including some time in Oklahoma City from 2011-14. Ben Gleason got his first NHL recall as Dallas had Roman Polak under the weather. Polak ultimately could not play, and Gleason is making his NHL debut this afternoon against Nashville. 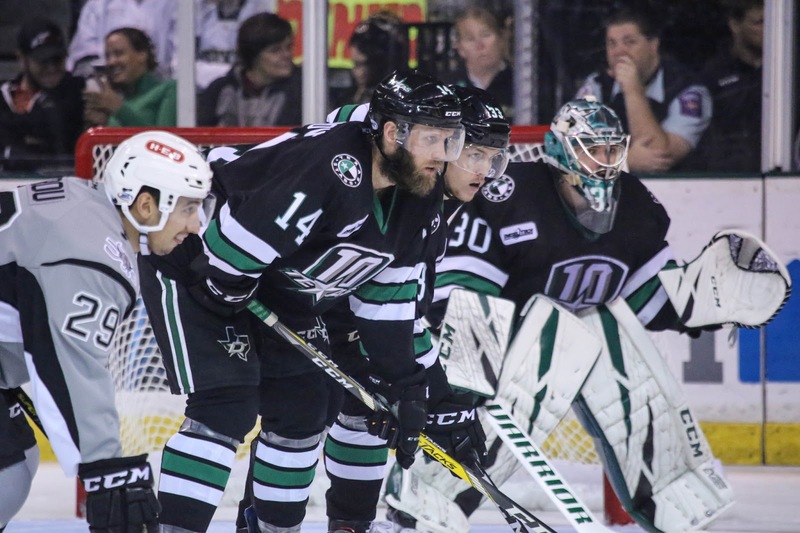 Finally, to backfill Gleason, the Stars signed D Brady Norrish from ECHL Idaho. With two new defensemen on the roster with no time to practice, it should be an interesting night regardless. It will be very interesting to see the power play units that Texas rolls out. With Heatherington, Hanley and Gleason in Dallas, someone is going to get a tryout on the point. 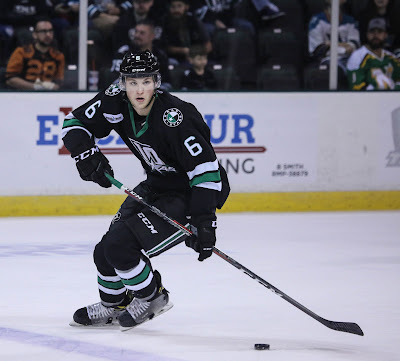 Dallas Stars General Manager Jim Nill announced today that the club has acquired defenseman Taylor Fedun from the Buffalo Sabres in exchange for a conditional seventh-round selection in the 2020 NHL Draft. Following the trade, Dallas has assigned Fedun to the Texas Stars. Fedun, 30, has recorded five assists (0-5=5) in nine games this season with the Rochester Americans (AHL). Among Rochester defensemen, he ranks third in assists (5) and fourth in points (5). Last season in seven regular-season NHL games with Buffalo, Fedun recorded one assist (0-1=1). The blueliner has appeared in 46 regular-season NHL contests over five seasons with Edmonton, San Jose, Vancouver and Buffalo, registering 15 points (2-13=15). 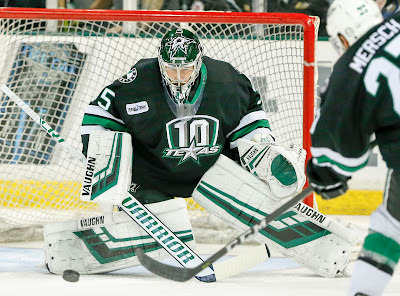 Fedun has amassed 176 points (40-136=176) in 346 AHL regular-season contests and posted eight points (4-4=8) in 31 Calder Cup Playoff contests. The 6-foot, 200-pound native of Edmonton, Alberta was originally undrafted and signed as a free agent by Buffalo on July 1, 2016. 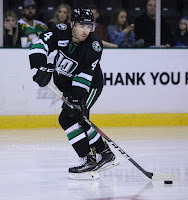 Dallas Stars General Manager Jim Nill announced today that the club has recalled defenseman Ben Gleason from the Texas Stars. Gleason is now the fifth Texas player to be recalled by Dallas and joins Dillon Heatherington, Denis Gurianov, and Joel Hanley on the roster. In an additional transaction, Texas has signed defenseman Brady Norrish from the team’s ECHL affiliate, the Idaho Steelheads. Gleason, 20, is tied for fifth among all Texas Stars players and leads Texas defensemen with six points (2-4=6) in 11 AHL games so far in his first professional campaign. Gleason also leads club defensemen and shares fifth among all Texas skaters with two goals this season. Norrish, 25, has played 13 games for the Steelheads as a rookie. The blue liner has earned 11 points (4-7=11) and is tied for second in scoring on the roster. Norrish is second among all ECHL defensemen in scoring and sixth among all rookie skaters in the league. The Strongfield, Saskatchewan native played four seasons at RIT before turning pro, earning 55 points (11-44=55) in 100 NCAA games. UPDATE: Big moves for Texas today. 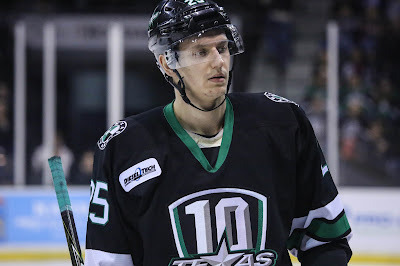 Taylor Fedun was acquired via trade and assigned to Texas while Ben Gleason was recalled to Dallas. Brady Norrish was signed to an AHL PTO and recalled from Idaho. Somehow we made it more than ten games into the season without a game against the in-state rival San Antonio Rampage. Texas will remedy that tonight as they begin a two-game weekend set against the Alamo City club. It has been a very unkind start to the season for the Rampage. They opened the season with a 4-0 win against the Griffins on home ice but didn't win again for three weeks, a stretch of eight games. With Ville Husso and Jordan Binnington in net, the issue hasn't been stopping goals. 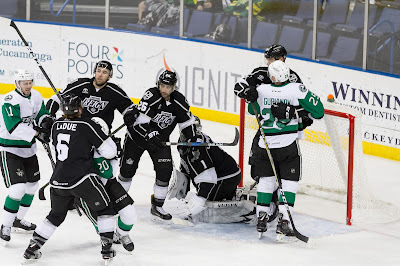 The Rampage rank 9th in the league in goals against at 2.85. Husso has regressed quite a bit in his second season, however, with a 1-7 record and a .890 SV%. However, San Antonio just can't score. They're 31st in the league and by a wide margin. Hershey is 30th at 2.29 goals per game and San Antonio is all the way down at a flat 2.0. Former Texas Star Brian Flynn leads the scoring with 1-7=8. Texas won't complain about facing a club that isn't lighting the lamp. They are missing defensemen all over and just swapped Colton Point down to Idaho for Philippe Desrosiers with hopes of sparking stronger play from the net out. Unless Gavin Bayreuther is ready for tonight's game, Texas will need another defenseman just to get to six healthy D on the roster. 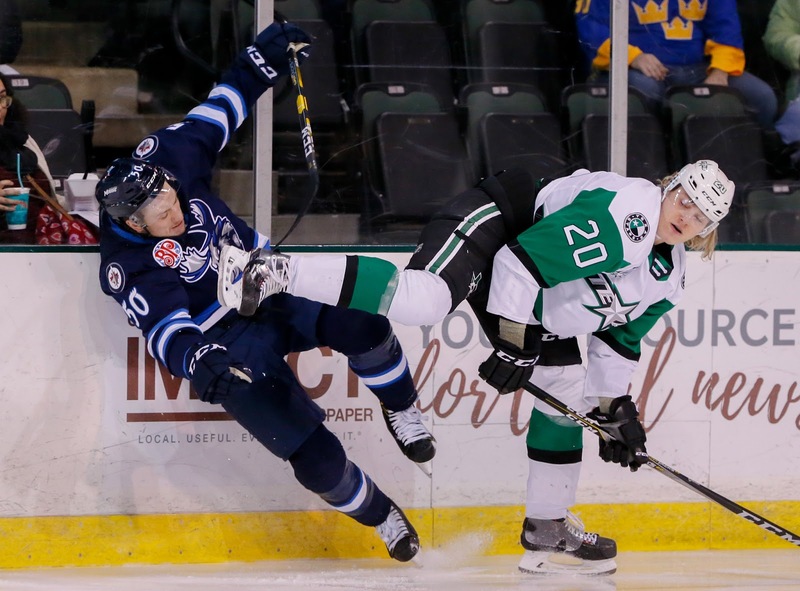 It's not getting any easier in Cedar Park as the Texas Stars lost another veteran defenseman this afternoon. 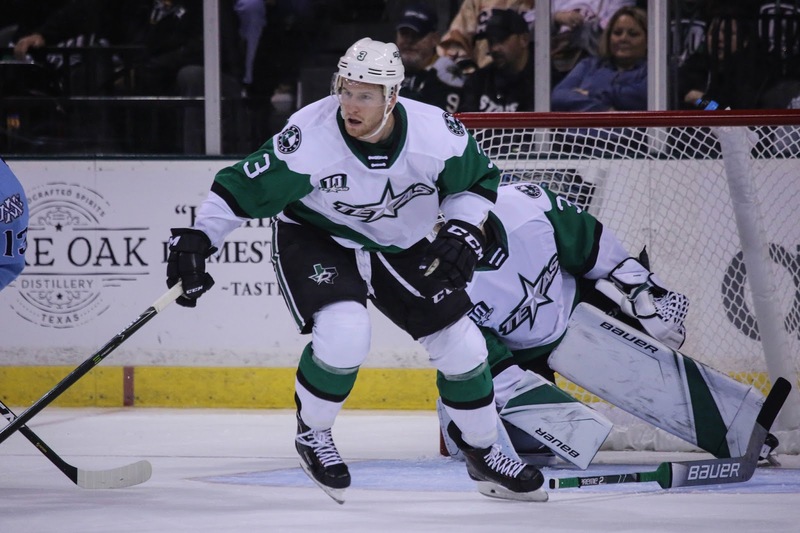 Joel Hanley was recalled to Dallas to backfill for John Klingberg, who was injured in last night's game with San Jose. With Gavin Bayreuther on the mend, Reece Scarlett out for the season and Dillon Heatherington already in Dallas, Texas will need to make a recall to join some combination of the following five defensemen tomorrow night: Shane Hanna, Ben Gleason, John Nyberg, Niklas Hansson and Ondrej Vala. Those five defensemen have a total of 139 games in the AHL between them. For contrast, Hanley has 270 on his own. Texas has not been getting the performances they need in terms of overall defensive play, forwards or defensemen. Stability would be a much needed salve to their issues at the moment. However, another salve is playing a last-place team, which is exactly what they will be doing this weekend. 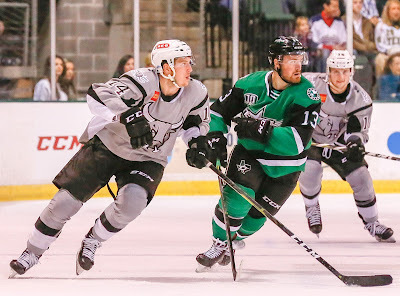 The Rampage have won just 3 games this year and could be a confidence boost for Texas in their two game set Saturday and Sunday. 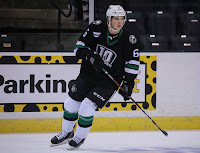 Dallas Stars General Manager Jim Nill announced today that the club has recalled defenseman Joel Hanley from the Texas Stars, Dallas' top development affiliate in the American Hockey League (AHL). 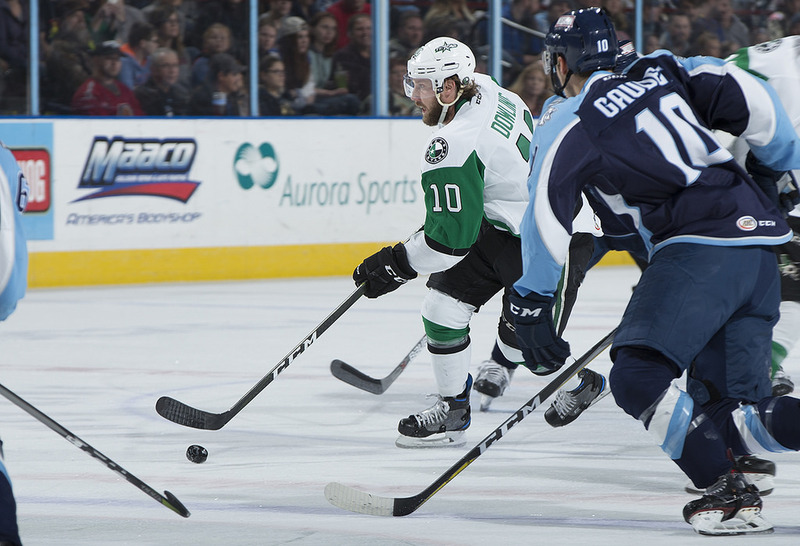 Hanley joins Dillon Heatherington and Denis Gurianov in Dallas and is the fourth Texas player recalled this season. With scoring depth dry as a bone in Dallas, the Stars's 2015 first rounder Denis Gurianov is on his way to the NHL for the second time in his career. Despite Texas being on a four-game losing skid, Gurianov is hot with 12 points in eleven games. It's a really big turnaround story for Gurianov, who was healthy scratched multiple times in the Calder Cup Finals last spring. While Dallas is definitely in desperation mode for some scoring, I wouldn't take anything away from the work that Gurianov has put in to get himself into a position where he is the first option for recall. In a corresponding move, Justin Dowling was reassigned to Texas. The center got into six games during his recall but only notched a single point, despite some time on the top line with Tyler Seguin and Jamie Benn. He will be an instant difference maker for Texas as they seek to replace the offense lost with Gurianov in Dallas. 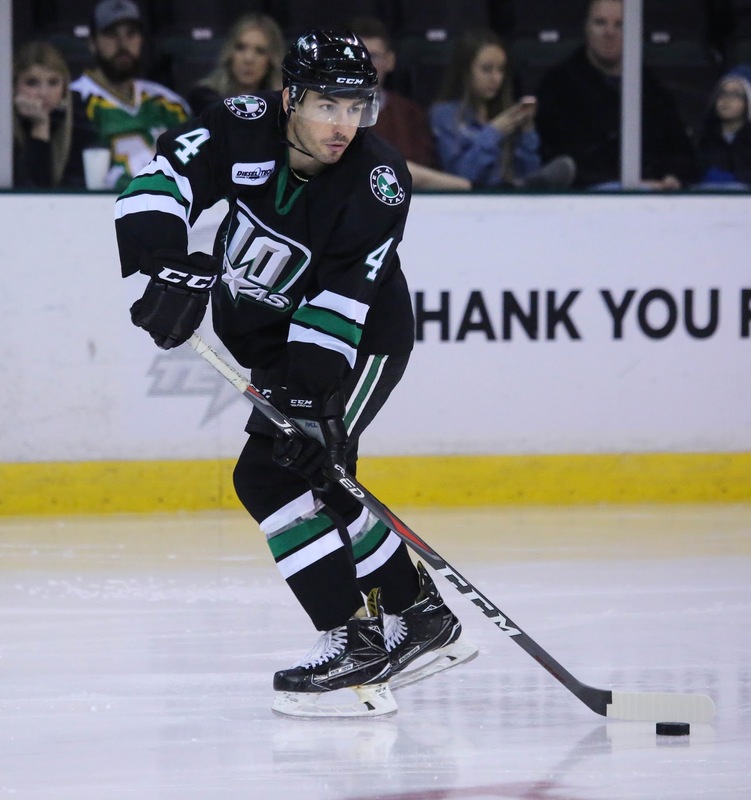 Dallas Stars General Manager Jim Nill announced today that the club has recalled forward Denis Gurianov from the Texas Stars. Additionally, the club assigned forward Justin Dowling to Texas. Following last weekend's pointless California trip and the overall four game losing streak that Texas is on, the Stars announced a few roster moves today. 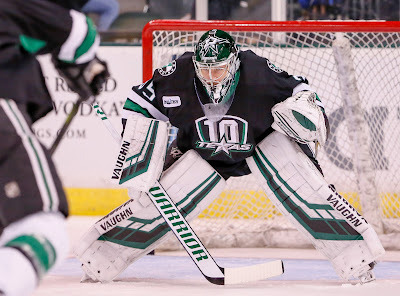 Most notably, Texas swapped goaltenders with Idaho with hopes that fourth year man Philippe Desrosiers will spark the Texas defense to higher heights. Colton Point was assigned to Idaho in a reciprocal move. The rookie Point has promise but has looked shaky in his starts. His lone win was a lucky one, as he found himself thanking his posts for at least four avoided goals against. On the forward front, Tony Calderone was sent to Idaho and Elgin Pearce was recalled. Pearce has a pair of assists in five games with the Steelheads. 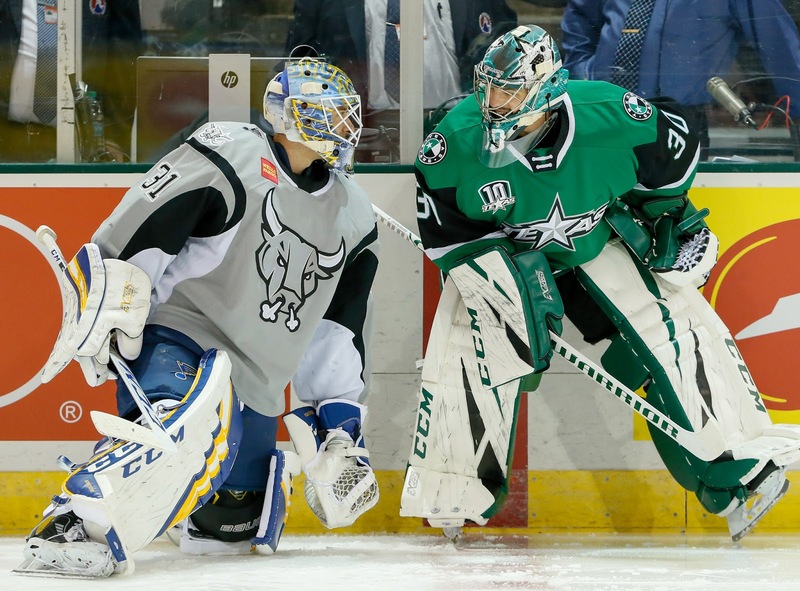 The Texas Stars, American Hockey League affiliate of the NHL’s Dallas Stars, announced several roster moves today as the Dallas Stars have reassigned goaltender Philippe Desrosiers to Texas from the team’s ECHL affiliate, the Idaho Steelheads, and also assigned Colton Point and Tony Calderone to Idaho from Texas. 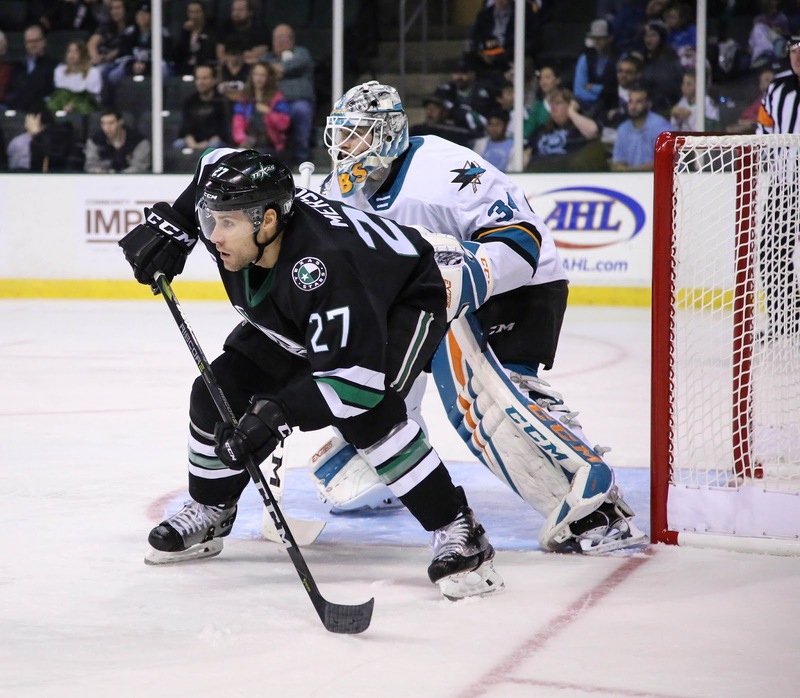 In addition, Texas has recalled forward Elgin Pearce from the Steelheads. 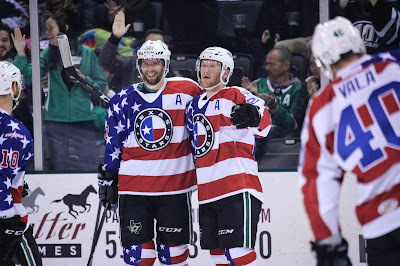 Texas's California roadtrip ended without a point to their name this evening as Bakersfield used a hot start to sink the Stars 4-3. Texas slips below .500 with the loss at 4-5-1-1. Colton Point got the start for the Stars, who have been alternating keepers pretty consistently. The rookie was pierced twice in the first five minutes and looked to be getting the pull after the second tally against. Landon Bow came in for all of 16 seconds before Point retook the ice and finished the game. At the end of the match, Point sits with a season GAA of 4.00 and save percentage of .854. The standard for pro goalies is usually .900 or better, so it's safe to say Texas is expecting more of its tenders. Those first two goals would set the Condors on a glide path for success. Joel Hanley scored his first of the season on the power play in the second period after Bako had already made it 3-0, and Erik Condra notched a goal late in the third to make it 4-2. Michael Mersch scored with one second left, but it was obviously too little too late to make a dent. 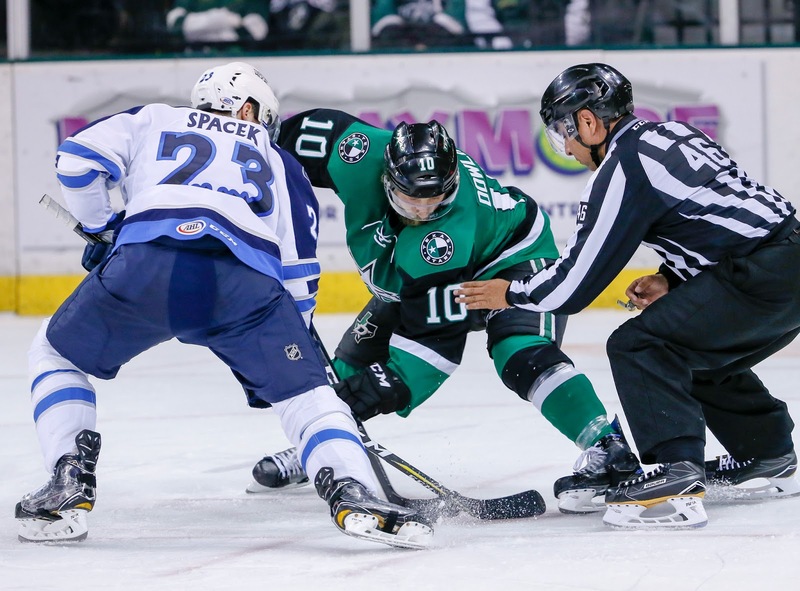 The Stars have a long layoff now until their next home game on Saturday in Cedar Park against San Antonio. Tonight’s attendance was not available at press time. Thursday's matchup was supposed to be an easy win to right the ship for Texas. However, hot offense and a rough PK and goaltending effort left them pointless in Ontario. Bakersfield is similarly positioned as the Reign in the Pacific Division standings. The recall of Dillon Heatherington yesterday add insult to injury on the backend, literally. The Stars are averaging 3.7 goals against per game but only 3.3 for. If you think the answer is to recall Philippe Desrosiers, that may not be the solve. 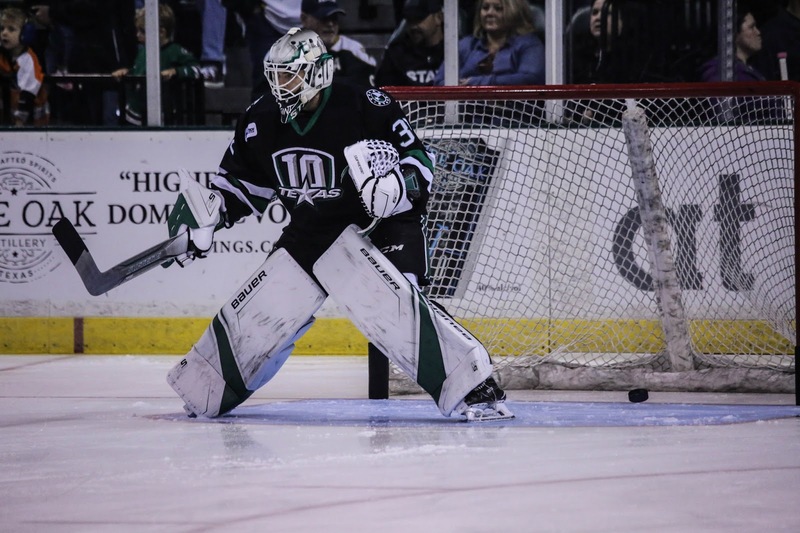 Desrosiers is 2-3-1 in the ECHL this season and just let up four on 31 shots last night in Toledo. 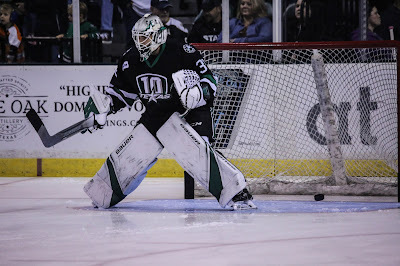 He personally has a 2.52 GAA and .920 SV%, which admittedly beats anything going on in the AHL this season for Texas. However, the level of competition is the other question. Texas is playing a Bakersfield team that scores a ton (4 goals/gm) but can't match those strong offensive nights with defensive performances to match. Of course, they have scored 8 goals in two different games (both against Stockton). Removing those two games from the total shifts it down to 12 goals in 5 games (2.4/gm) and gives a better picture of where they're at as a team. One blast from the past to watch for tonight is Al Montoya. The Oilers picked up the vet tender last season in a trade with the Canadiens. He hasn't played against Texas since the four seasons he spent in San Antonio in the early 2010s. When it rains, it pours. 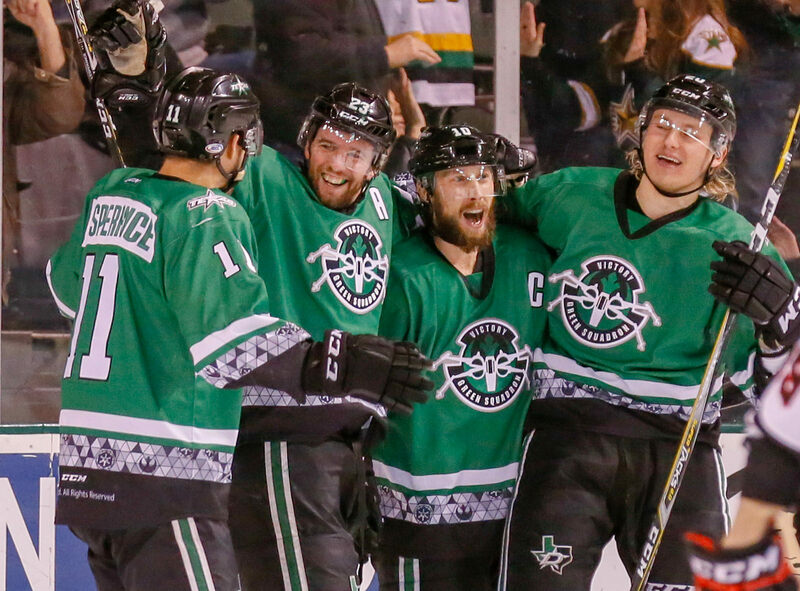 The Dallas Stars have recalled defenseman Dillon Heatherington to the NHL, leaving Texas in quite a lurch regarding their veteran defensive skaters. 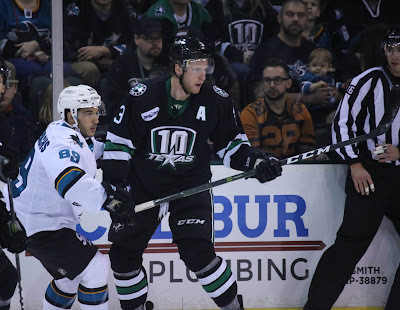 With Reece Scarlett out for the season and Gavin Bayreuther on the shelf temporarily, Heatherington's departure leaves just Joel Hanley as the only Texas defenseman not in his first or second year in the league. That list of remaining defenseman is Hanley, Shane Hanna, Ben Gleason, Niklas Hansson, John Nyberg and Ondrej Vala. More information is needed on Connor Carrick's health and the timetable for Stephen Johns's return before anything can be said definitively. 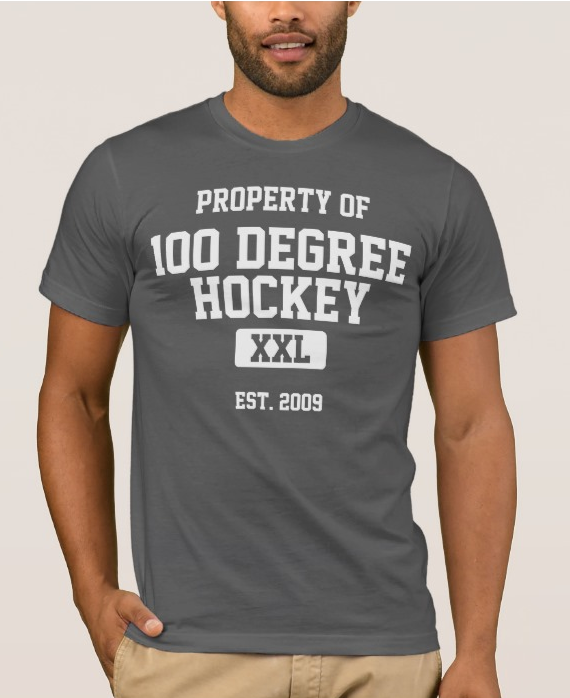 However, if both continue to be out and the Texas Stars continue to struggle on goals against (3.7/gm, #20 in AHL), a more permanent solution may be needed that could involve getting another body in Cedar Park. Unless Bayreuther is ready for tomorrow's game against Bakersfield, I would expect a recall from Idaho to get to seven defensemen. 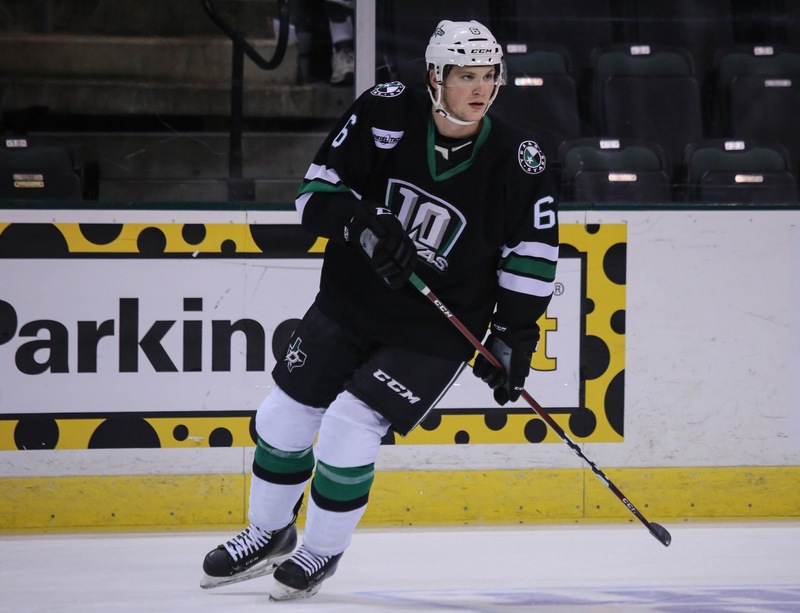 Dallas Stars General Manager Jim Nill announced today that the club has recalled defenseman Dillon Heatherington from the Texas Stars, Dallas' top development affiliate in the American Hockey League (AHL). Heatherington is the second Stars skater to earn a call-up to the NHL this season, joining Justin Dowling in Dallas. The Texas Stars couldn’t get off the schneid on Thursday and dropped a third consecutive game, falling to the Ontario Reign 5-3. Ontario’s leading scorers Matt Luff and Matt Moulson came to play, tallying three and two points respectively. Rookie Sheldon Rempal found the net twice including the game winner. The Stars got the start they were looking for on the road with a goal from Adam Mascherin that came on the first shot for Texas. Mascherin finished the game with a helper to go with his tally. The Reign quickly seized control for the next several shifts of the period with two successive goals coming in a span four minutes. Ontario’s top scorer Luff was left unmarked on the back door and made tied the game up with a one timer just over four minutes into the contest. Near the eight minute marker, Stars defenseman Dillon Heatherington was forced into an errant clearing attempt that centered the puck in front of Bow’s crease leading to a goal from Sheldon Rempal. Atoning for the sloppy stretch of play, the Stars owned rest of the opening frame, answering with two more goals of their own. Gleason goal came on a sweet toe drag that got him into the slot to beat Petersen clean with a wrist shot with four minutes left of play in the period. The aggressive play of the top line gave the Stars a power play before intermission. Colton Hargrove was obliged to capitalize on a slick feed from defenseman Joel Hanley to give the Stars a one goal lead heading into the locker room. The frantic pace of play favored the Stars, as they outshot the Reign 15-10. Ontario’s second lead scorer Moulson got in on the action only thirteen seconds into the middle frame, pushing his point total to ten on the season. The Stars earned five power play chances to break the tie, but the score would hold through the end of the period. It wasn’t for lack of effort, as the Stars made Petersen stand on his head while they peppered him with eighteen shots. Coming up blank with so much time on the man advantage would spell demise for the Stars. 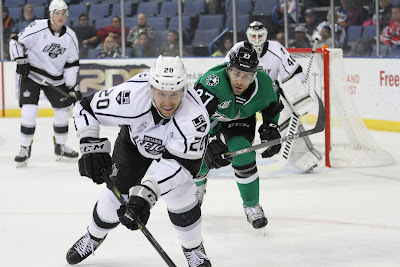 The Reign completely controlled play in the third period, outshooting the Stars 15-4. Joel L’Esperance took a tough penalty in the closing minutes which led to Rempal’s game winning goal on the power play. Luff’s second goal was scored into the empty net with seventeen seconds left of play. The Stars will lick their wounds and finish their California trip on Saturday against the Bakersfield Condors. The puck drops at 9:00 PM CDT. After suffering their worst loss of the season last Saturday at home to the San Jose Barracuda, the Texas Stars need a palate cleanse. Sometimes, a road trip provides that opportunity due to the bonds that are inevitably forged within a team collectively pursuing an identity. The Stars hope that's the case as they head into southern California to take on the Ontario Reign on Thursday evening. In their initial meeting of the year against their former rival from the Pacific Division, forward Michael Mersch will play his first game against his former team with whom he spent the first four plus years of his professional career going back to when the Reign were the Manchester Monarchs. 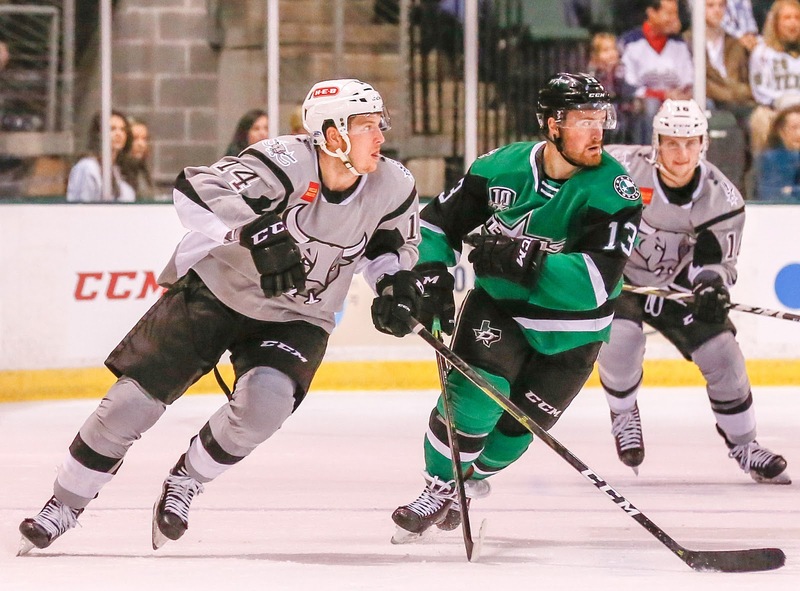 The Stars have to be thrilled that Mersch is no longer wearing black and silver, as he is scoring at a point per game clip with his new team in Texas. 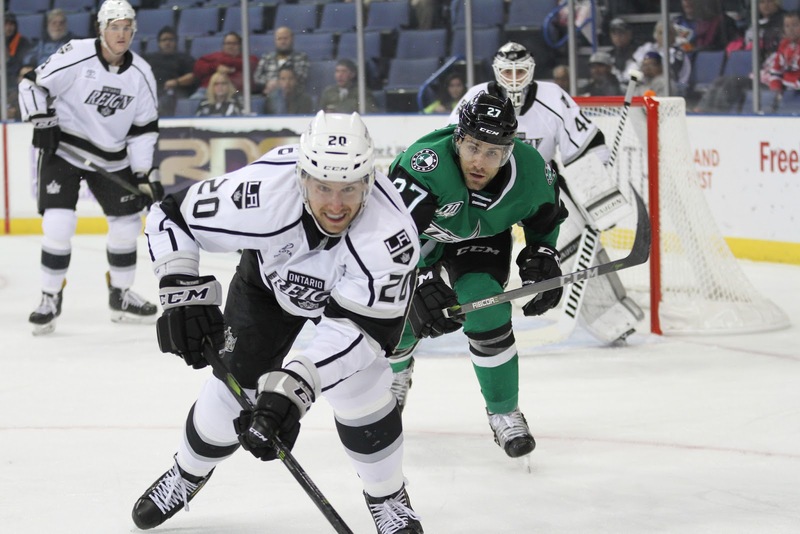 The Reign only have one win in eight games, a miserable start for any team. They have guys that put the puck in the net in spades with Matt Luff, Matt Moulson, and Brett Sutter all at nine points in eight or fewer games. Where they are really struggling this year is in net. 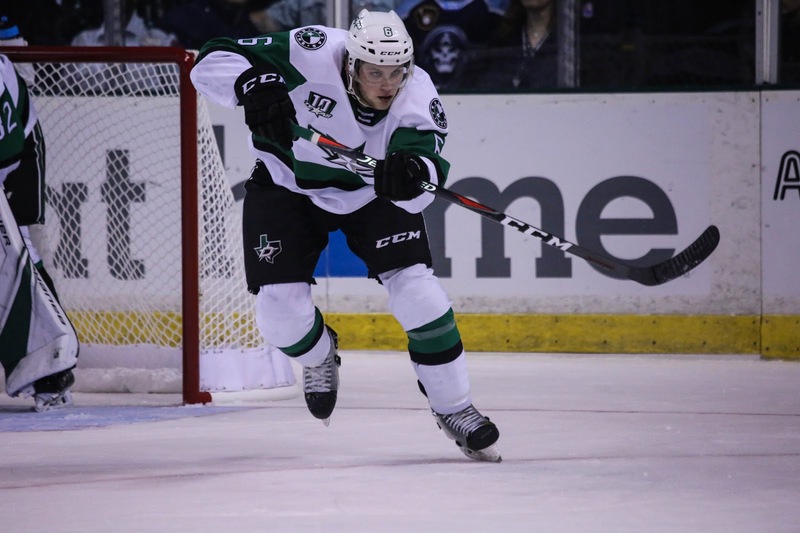 Cal Petersen was somewhat of a revelation for the Reign during his rookie season last year, helping his team get to the playoffs before they lost in the first round to the Stars. This season, Petersen is allowing 4.78 goals per game in seven games. That's a recipe that doesn't lead to a lot of wins. A game like this against a struggling opponent could be exactly what the Stars need to put their winless weekend behind them.